My wife, Alene, and I pulled into the Alpine Meadows parking lot at 9:00am. Alpine had the snow blowers going around the base and up one of the lower runs. Alene was there to give ski lessons and I was there to go mountain biking. 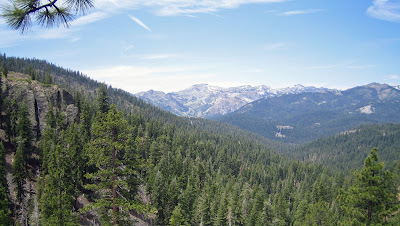 My plan was to ride the Western States Trail from Highway 89 to The Tahoe Rim Trail and return. This section of the Western States Trail is not the trail the Western States runners use, but it is used by the Tevis Cup horse racers. The Cup racers come down the Western States Trail from the Robie Equestrian Park near the back side of NorthStar. The crossing at Highway 89 is approximately mile 9. The single track trail winds steeply up through the trees for 2 miles where it crosses a fire road. The States trail bears hard left on a fire road and my route is a slight left and goes up “the wall”. The wall is a ½ mile very steep fire road that leads to the Tahoe Rim Trail. I didn’t encounter any snow until I came to the wall. The snow (7,000 foot level) was a deal breaker on this steep slope, so I turned around and continued out the States trail for another mile. I encountered numerous snow crossings that were rideable as long as it wasn’t too steep. I had to turn around when the going got too steep again. Riding the trail back down to 89 is a riders delight. It’s fairly rock free and non technical so it’s very fast. The ground was still frozen when I was riding, so there was excellent traction and dust free. I was the only one out there so I could really rip. Back at Alpine the air temperature was still low, so the snow blowers were still going. I understand Alpine is buying water from the local municipality now. Alene had fun teaching on the snow and I had fun on the singletrack. The next time I go mountain biking in 25 degree weather, I’ll bring some tights. The legs got a little cold before the first climb. The States trail crosses under Highway 89 at the highway bridge that is midway between the entrances to Squaw Valley and Alpine Meadows. The trail (no signage) is easily visible on the East side of the Truckee River right next to the highway bridge. Parking is available at the Squaw Valley Park at the entrance to Squaw Valley. This park is closed and gated during the winter, but you can park near the gate.